Part used: Fresh or dried whole fruit. • Rasa: primarily amla, tikta and kaṣāya, but also madhura, noticed particularly while drinking water after one has consumed the fruit. Kaṭu is a minor, secondary taste, whereas lavaṇa is absent. • Prabhāva: Āmalakī is said to be sāttvika, bringing good fortune, love and longevity to those that consume it (Dash 1991, Dash & Junius 1983, Frawley & Lad 1986, Srikanthamurthy 2001 Warrier et al 1995). Constituents: Āmalakī fruit contains a series of diterpenes referred to as the gibberellins, as well as the triterpene lupeol, flavonoids (e.g. kaempherol-3-O-ß-Dglucoside, quercetin-3-O-ß-Dglucoside), and polyphenols (e.g. emblicanin A and B, punigluconin and pedunculagin). Also present are the phyllantine and zeatin alkaloids, and a number of benzenoids including amlaic acid, corilagin, ellagic acid, 3-6-di-O-galloyl-glucose, ethyl gallate, 1,6-di-O-galloyl-ß-Dglucose, 1-di-O-galloyl-ß-Dglucose, putranjivain A, digallic acid, phyllemblic acid, emblicol, and alactaric acid. The fruits are also stated to contain significantly high amounts of ascorbic acid (vitamin C), upwards of 3.25% in the dried fruit, but this has also been disputed (Bhattacharya 1999, Ghosal et al 1996, Khopde et al 2001, Summanen 1999, Yoganarasimhan 2000). • Human trials: A daily dose of 2-3 g E. officinalis powder significantly improved high-density lipoprotein-cholesterol and lowered low-density lipoprotein-cholesterol levels in both normal and diabetic volunteers (Akhtar et al. 2011). A double blind randomized control trial was conducted among 57 volunteers to compare the efficacy of a 6% triphala solution against 0.2% chlorhexidine solution against Streptococcus mutans. Results demonstrated that the triphala mouth rinse had a comparable activity to chlorhexidine against Streptococcus mutans, without the same side-effects (Srinagesh and Pushpanjali 2011). Researchers found that the oral administration of a 1:1 mixture of epigallocatechin-3-gallate and Emblica officinalis for 3 months significantly improved antioxidant defense as well as diabetic and atherogenic indices in uremic patients with diabetes (Chen, Liou et al. 2011). In 56 females aged 18-60 suffering from various stages of melasma, Emblica officinalis was found to be a safe and equally effective alternative to a cream prepared with 2% hydroquinone (Costa et al 2010). Fresh Āmalakī demonstrated a significant hypocholesterolemic effect in both normal and hypercholesterolemic men aged 35-55 years (Jacob et al 1988). Toxicity: Āmalakī is widely consumed throughout India as a medicinal food and is not considered toxic. Indications: Dyspepsia, gastritis, biliousness, hyperacidity, hepatitis, constipation, flatulent colic, colitis, hemorrhoids, convalescence from fever, cough, asthma, skin diseases, bleeding disorders, menorrhagia, anemia, diabetes, gout, osteoporosis, premature graying, alopecia, asthenia, mental disorders, vertigo, palpitations, cardiovascular disease, cancer. Contraindications: Acute diarrhea, dysentery (Frawley & Lad 1986). Medicinal uses: Āmalakī is among the most important medicinal plants in the materia medica of Āyurveda, and along with Harītakī and Bibhītaka forms the famous Triphalā formula, used to cleanse the dhātavaḥ of āma, pacify all three doṣāḥ, and to promote good health and long life. A synonym for Āmalakī is Dhātrī or ‘nurse’, indicating that it has the power to restore health like a mother caring for her child. The fruit is the most commonly used plant part, and the fresh fruit is preferred. An excision in the unripe fruit is made and the exudate collected is used topically in conjunctivitis (Kirtikar & Basu 1935). The unripe fruits are also made into pickles and given before meals to stimulate the appetite in anorexia (Nadkarni 1954). The fresh juice of the fruit mixed with ghṛta is a rasāyana, has a beneficial activity upon the intestinal flora, and is a corrective to colon function. The fresh fruit is very hard to come by outside of the subcontinent, and can usually be found in Indian markets for only a few weeks during the fall. The dried fruit is used as a decoction to treat ophthalmia when applied externally, and is used internally as a hemostatic and antidiarrheal (Nadkarni 1954). The boiled, reconstituted dried fruit, blended into a smooth liquid with a small quantity of guḍa added, is useful in anorexia, anemia, biliousness dyspepsia, and jaundice. This is also an excellent restorative in chronic rhinitis and fever, with swollen and dry red lips and rashes about the mouth. The dried fruit prepared as a decoction and taken on a regular basis is useful in menorrhagia and leucorrhea, and is an excellent post-partum restorative. Similarly the Cakradatta recommends the fresh juice of Āmalakī with Āmalakī cūrṇa, taken with ghṛta and honey as a vajīkaraṇa rasāyana. In the treatment of cardiovascular disease Āmalakī is an excellent anti-oxidant botanical, used to treat all of the cardiovascular effects of poorly controlled diabetes and insulin resistance, including diseases of microcirculation such as macular degeneration. Āmalakī is similarly taken in polluted urban areas to keep the immune system strong. 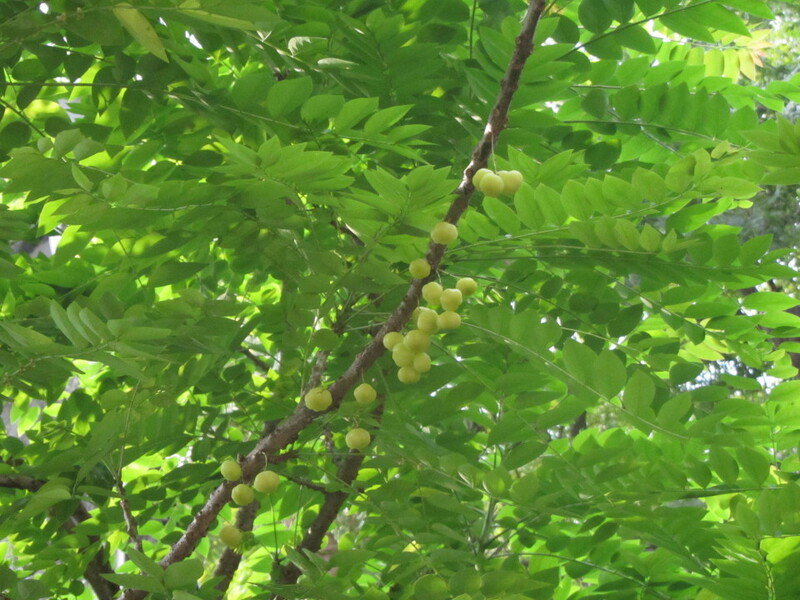 For coronary heart disease in particular Āmalakī can be combined with Arjuna, or non-Indian botanicals such as Hawthorn, and with Guggulu for dyslipidemia. Taken with Guḍūcī, Kaṭuka, and Bhūnimba, Āmalakī forms an important protocol in the treatment of hepatitis and cirrhosis. Āmalakī is also an important herb to consider to protect the body against the deleterious effects of chemotherapy and radiation in conventional cancer treatments. In combination with Citraka, Harītakī, Pippalī and saindhava, Āmalakī cūrṇa is mentioned by the Śāraṅgadhara saṃhitā in the treatment of all types of fever (Srikanthamurthy 1984). In the treatment of nausea, vomiting and poor appetite fresh Āmalakī is crushed with Drākṣā and mixed with sugar and honey (Sharma 2002). Āmalakī fruit fried in ghṛta and reduced to a paste and mixed with fermented rice water is applied over the head to treat nosebleeds (Srikanthamurthy 1984). In the treatment of agnimāndya, edema, abdominal enlargement, hemorrhoids, intestinal parasites, diabetes and allergies three parts Āmalakī cūrṇa is mixed with the same amount each of Ajamodā, Harītakī and Marica with 1 part pañca lavaṇa macerated in buttermilk until it has fermented (Sharma 2002). Combined with equal parts Guḍūcī, Śūṇṭhī, Āragvadha and Gokṣura, dried Āmalakī fruit is recommended by the Cakradatta as a decoction in the treatment of urinary tenesmus (Sharma 2002). Āmalakī is the primary constituent of a complex polyherbal lehya called Cyavanaprāśa that is used as a rasāyana, and in the treatment of chronic lung and heart diseases, infertility and mental disorders (Sharma 2002). Another valued rasāyana that contains Āmalakī as the primary constituent is Brahmārasāyana, giving the person that takes it “…the vigor resembling an elephant, intelligence, strength, wisdom and right attitude” (Srikanthamurthy 1995). The dried fruit made into an oil and applied to the head, and taken internally as a decoction or powder, is reputed to be useful in alopecia and adds luster and strength to the hair. Similarly, the Cakradatta recommends a nasya of equal parts Āmalakī and Yaṣṭimadhu decocted in milk, in the treatment of alopecia (Sharma 2002). Both the fresh juice and crushed seeds are combined with Haridrā as an effective treatment for diabetes (Dash and Junius 1983, Sharma 2002). The seeds are made into a fine powder and mixed with equal parts powder of Aśvagandhā root as a rasāyana in the cold winter months (Nadkarni 1954). For scabies and skin irritations the seed is charred, powdered and mixed into sesame oil and applied externally (Nadkarni 1954). • Cūrṇa: 3-10 g b.i.d.-t.i.d. • Kvātha: 1:4, 60-120 mL b.i.d.-t.i.d. • Tincture: 1:3, 30% alcohol, 1-10 mL b.i.d.-t.i.d.